If you have a child that is bursting with energy, Connecticut’s many play centers provide the perfect space for them to let loose. With a variety of options for children of different ages and stages, you won’t have a hard time finding something to suit your little one. From bouncy fun centers to well-maintained play gyms, here are the 10 best kids’ play centers in Connecticut. A perfect place for your toddler to release some energy during a rainy day, Bounce Fun Center offers rooms packed full of safe, clean bouncy equipment. For those two and under, there is also an enclosed area with a slide, ball pit, tubes to climb through, and more. The prices at Bounce Fun Center are also very reasonable, making this an excellent option for parents on a budget. To encourage your child's imagination, Tot Town Party and Play offers story and craft times and two designated play areas. One area is designed for children up to the age of six and features a ball pit and climbing equipment. The other area is perfect for crawlers, providing a safe place for young children to explore their environment. Tot Town Party and Play can also be booked for birthday parties. Perfect for children ages one through ten, the Kids Play Museum provides an imaginative play space and a schedule packed with fun events. Let kids pretend in a kid-sized grocery store or diner, romp in a fire truck, or get creative with a Magneato table. There is also an area perfect for crawlers or new walkers, with large soft blocks and wall-mounted games. Staff are also trained in English, Spanish, and ASL. 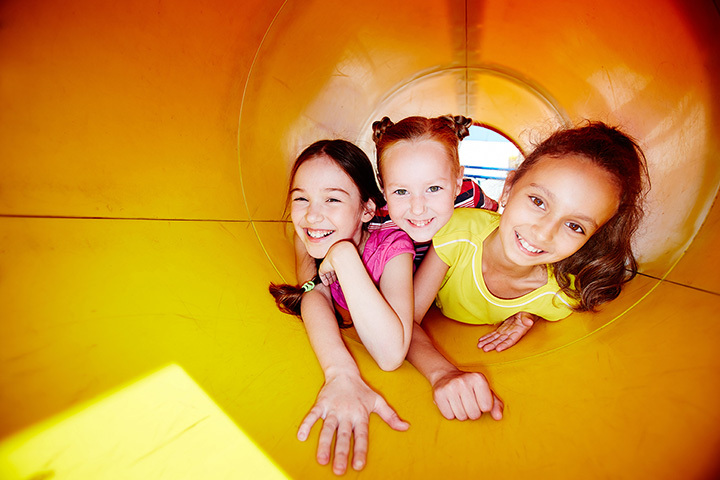 Stop by during an open play time so children can explore the indoor climbing structures, slides, and climbing walls. Special equipment helps children to develop motor skills while playing in a safe, clean environment. In addition, Whippersnapper's Play Gym also offers classes for little ones including toddler yoga. The Little Green Tambourine offers open play on Mondays and Fridays for children ages one to five. During open play time, children will have the chance to play on an indoor playscape, build their imagination with a drama play area, or dress up in fun clothing. On other days of the week, the Little Green Tambourine offers classes such as after school cooking for children ages four to nine and preschool adventures for children ages three to five. Aside from bookings for birthday parties, Pump It Up offers open jump times so families can come let little ones jump out some energy. On-site, children will be able to play on giant inflatables that feature wall climbing, basketball, slides, and more. In addition, they also have large soft blocks for children to build with, Little Tykes cars, and air hockey. To have fun together as a family, Central Rock Gym encourages parents and children to climb together. If this is your first time climbing, opt to reserve a staff belay, so that you can get started climbing without learning about belay first. Children of any age can participate in climbing and birthday parties are available on-site as well. Kidz Klub is a popular indoor play center for children that features soft play areas, tunnels, a ball pit, trampolines, and activities such as crafts. There is even a designated area for infants and toddlers, with soft climbing structures, ride on toys and cars, and ample soft mats for safety. Parents and guardians are welcome to accompany children in the play structure to lend a hand or have fun on the structures for family fun. Jump Off is an indoor trampoline park and large play zone. In addition to trampolines, you'll find a foam pit, large climbing structure, basketball lanes, and a cool battle beam. This indoor play area is perfect for older children who need to unplug, get out of the house, and have some fun. Open jump hours are offered daily, with special times designated for teens and children with special needs. Do note that specific socks are required for play and these will need to be purchased upon arrival. Perfect for active children ages two to 12, Andie's Bounce Barn is a large inflatable indoor play center that is available for open play or birthday parties. Several open play times are offered weekly, so you can treat your children to a fun few hours spent bouncing on all equipment. Note that socks are required to be worn during play.